Burn Rate refers to the rate at which a company depletes its cash pool in a loss-generating scenario. It is a common metric of performance and valuation for companies, including start-ups. A start-up is often unable to generate a positive net incomeNet IncomeNet Income is a key line item, not only in the income statement, but in all three core financial statements. While it is arrived at through the income statement, the net profit is also used in both the balance sheet and the cash flow statement. in its early stages as it is focused on growing its customer base and improving its product. As such, seed stage investors or venture capitalistsPrivate Equity vs Venture Capital, Angel/Seed InvestorsCompare private equity vs venture capital vs angel and seed investors in terms of risk, stage of business, size & type of investment, metrics, management. This guide provides a detailed comparison of private equity vs venture capital vs angel and seed investors. It's easy to confuse the three classes of investors often provide funding based on a company’s burn rate. How to Calculate Burn Rate? 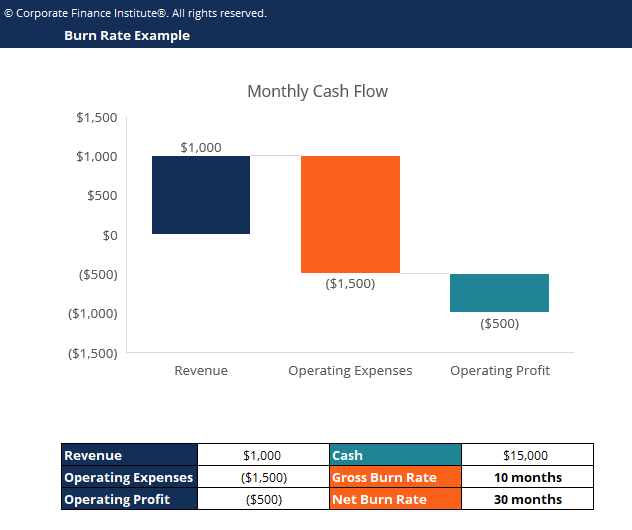 Gross Burn Rate is a company’s operating expensesFixed and Variable CostsFixed and variable costs are important in management accounting and financial analysis. Fixed costs do not change with increases/decreases in units of production volume, while variable costs are solely dependent on the volume of units of production. This guide teaches an analyst the fixed vs variable cost methods. It is calculated by summing all its operating expenses such as rent, salaries, and other overhead, and is often measured on a monthly basis. It also provides insight into a company’s cost drivers and efficiency regardless of revenue. Net Burn Rate is the rate at which a company is losing money. It is calculated by subtracting its operating expenses from its revenue. It is also usually stated on a monthly basis. It shows how much cash a company needs to continue operating for a period of time. However, one factor that needs to be controlled is the variability in revenueRevenue Run RateRevenue Run Rate is a metric high growth companies use to convert weekly, monthly, and quarterly revenue into an annual figure. This metric is often used by rapidly growing companies, as data that's even a few months old can understate the current size of the company. See guide, example, formula. A fall in revenue with no change in costs can lead to a higher burn rate. What are the Implications of a High Burn Rate? A high burn rate suggests that a company is depleting its cash supply at a faster rate. It indicates that is it at a higher likelihood of entering a state of financial distress. This may suggest that investors will need to more aggressively set deadlines to realize revenue given a set amount of funding. Alternatively, it would mean that investors would be required to inject more cash into a company for it to realize revenue. How to Reduce Burn Rate? 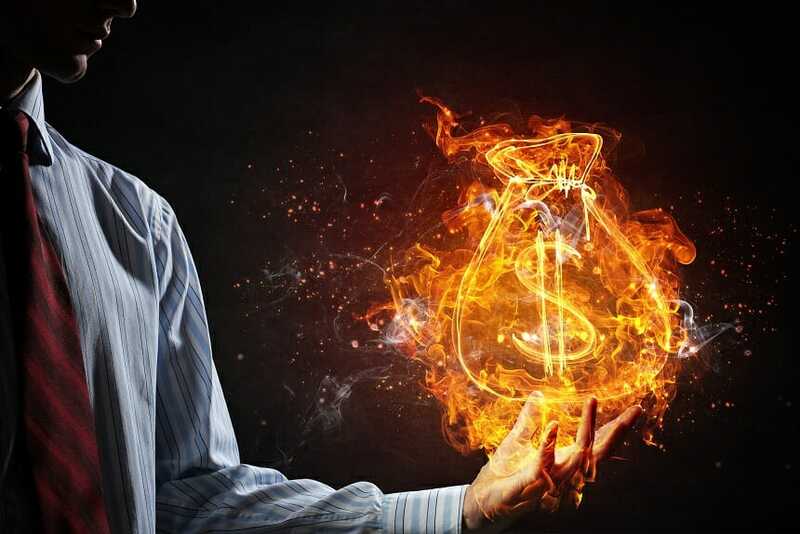 Typically, an investor may negotiate a clause in a financing deal to reduce staff or compensation if a company is experiencing a high burn rate. Layoffs often occur in larger start-ups that are pursuing a leaner strategy or have just agreed to a new financing deal. A company can project an increase in growth that improves its economies of scale. This allows it to cover its fixed expenses such as overheads and R&D to improve its financial situation. For example, many food delivery start-ups are in a loss-generating scenario. However, forecasts in growth and economies of scale encourage investors to further fund these companies in hopes of achieving future profitability. Often, companies spend on marketing in order achieve growth in its user base or product use. However, start-ups are often constrained in the sense that they lack the resources to use paid advertising. As such, growth ‘hacking’ is a term often used in start-ups to refer to a growth strategy that does not rely on costly advertising. One example is Airbnb engineers reconfiguring Craigslist in order to redirect traffic from Craigslist onto its own site. When building a financial modelWhat is a Financial Model?A financial model is a representation of a company’s past and future performance based on it's assets & operations. Find out: what is a financial model? for a startup or early-stage business, it’s important to highlight the monthly burn rate and the runway until the next financing is required. Early stage businesses will often raise money in phases to fund different stages, so it’s important to highlight how long the company will last until it needs more money. 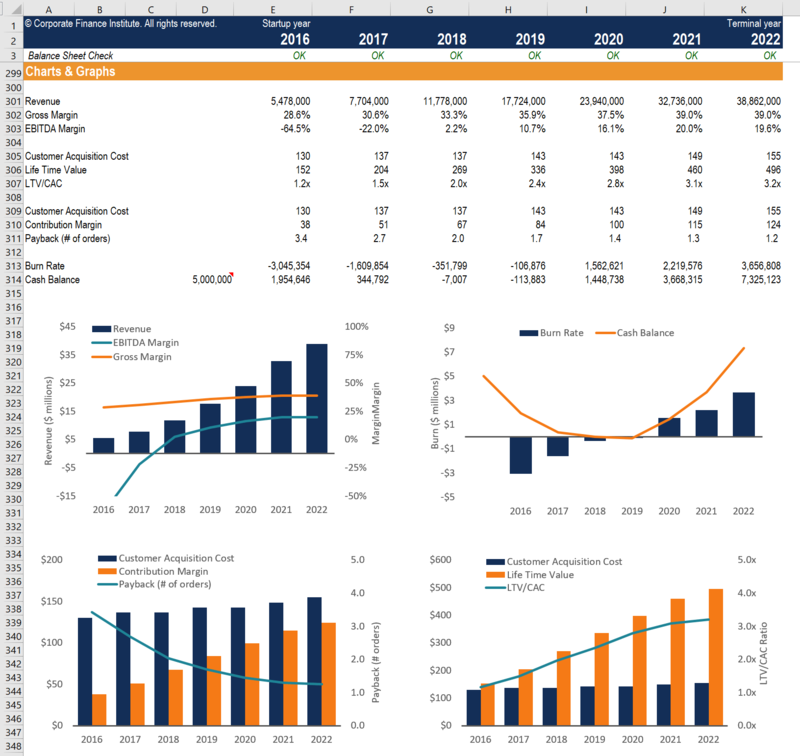 The above image is an e-Commerce financial model showing the company’s cash balance over time. Financial Analyst CertificationFMVA™ CertificationThe Financial Modeling & Valueation Analyst (FMVA)™ accreditation is a global standard for financial analysts that covers finance, accounting, financial modeling, valuation, budgeting, forecasting, presentations, and strategy.